Paul McCartney Tries to Recapture a Fresh Sound For his latest CD, Chaos and Creation in the Backyard, Paul McCartney sought the help of producer Nigel Godrich. Though McCartney normally keeps a tight hold on the creative process, he allowed Godrich to take the album in unexpected directions. Paul McCartney and producer Nigel Godrich talk about their collaboration on "Chaos and Creation in the Backyard." 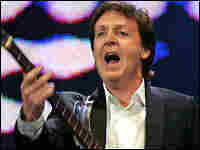 Sir Paul McCartney -- now 63 -- has spent the better part of his life playing music for crowds numbering in the thousands. Many of his fans squeal with delight just at the sight of the former Beatle. 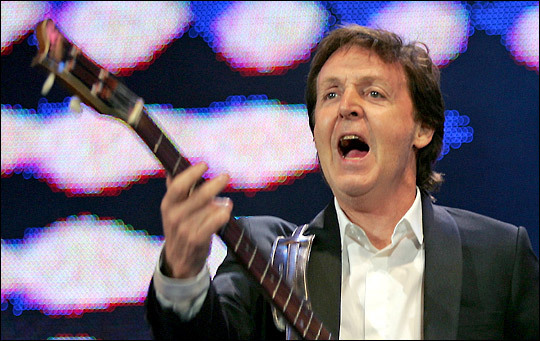 Paul McCartney performs at the Live 8 concert in Hyde Park in London in 2005. The recording of his latest CD, Chaos and Creation in the Backyard, effectively reduced McCartney's audience to one: producer Nigel Godrich. McCartney talked with NPR's Steve Inskeep about the recording process, just before a recent concert in Washington, D.C. He said that working on Chaos was almost like going back to school again because producer Godrich wasn't afraid to call into question some of McCartney's musical choices. By some estimations, the collaboration has resulted in McCartney's best music in years.